Katherine is a true champion of children’s literature. Until 2015, she worked for reading charity Book Trust where she was the project manager of the Children’s Laureate scheme and worked on a range of other children’s books prizes and campaigns. She is part of the founding team behind Down the Rabbit Hole, a monthly show for arts radio station Resonance FM discussing children’s literature. 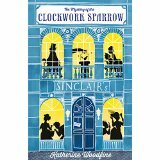 Her first book, the bestselling The Mystery of the Clockwork Sparrow was shortlisted for the Waterstones Children’s Book Prize, the Weald Book Awards, the Cumbria SLS Book Award, the NE Book Award and the Leeds Book Award, as well as longlisted for the Branford Boase Award and nominated for the CILIP Carnegie Medal. She now combines writing with working freelance on a range of book-related projects, including managing YALC, the UK’s Young Adult Literature Convention. Watch a video about her research process, hosted by YA Shot as part of her debut tour! Find Katherine on Twitter @followtheyellow and on her website. 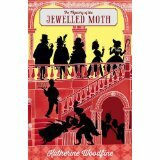 Wonder at the puzzling disappearance of the Jewelled Moth! Marvel as our heroines, Sophie and Lil, don cunning disguises, mingle in high society and munch many cucumber sandwiches to solve this curious case! Applaud their bravery as they follow a trail of terrible secrets that leads straight to London’s most dangerous criminal mastermind, and could put their own lives at risk. It will be the most thrilling event of the season! 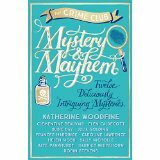 Mayhem and Mystery by The Crime Club: Twelve mysteries. Twelve authors. One challenge: can YOU solve the crimes before the heroes of the stories? These are twelve brand-new short stories from twelve of the best children’s crime writers writing today. These creepy, hilarious, brain-boggling, heart-pounding mysteries feature daring, brilliant young detectives, and this anthology is a must for fans of crime fiction and detection, especially the Murder Most Unladylike Mysteries, The Roman Mysteries and The Mystery of the Clockwork Sparrow. The Crime Club are twelve UK-based authors who are mad about crime fiction. Clementine Beauvais, Elen Caldecott, Susie Day, Julia Golding, Frances Hardinge, Caroline Lawrence, Helen Moss, Sally Nicholls, Kate Pankhurst, Robin Stevens, Harriet Whitehorn and Katherine Woodfine can be found anywhere there is a mystery to be solved, a puzzle to be cracked or a bun to be eaten, and they are always ready for the next puzzling case.